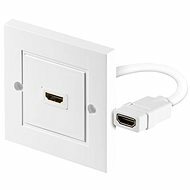 This double RJ-45 socket is designed to be mounted on a wall. For a quick and easy installation, it is equipped with self-tapping contacts so that it is not necessary to buy a special crimping tool. For shipping to other EU countries visit this page Datacom, CAT5E, UTP, 2x RJ45, Surface. Für Versand nach Deutschland, besuchen Sie bitte Datacom-Buchse CAT5E, UTP, 2 x RJ45, Aufputz. Chcete doručit zboží do Česka? Prohlédněte si Datacom CAT5E UTP 2x RJ45 na omítku. Chcete doručiť tovar na Slovensko? Prezrite si Datacom, CAT5E, UTP, 2x RJ45, na omietku. Für Versand nach Österreich, besuchen Sie bitte Datacom-Buchse CAT5E, UTP, 2 x RJ45, Aufputz. Magyarországra történő kiszállításért tekintse meg ezt a termékoldalt: Datacom CAT5E UTP RJ45 2x felületre szerelt.